A few weeks ago, when the weather was still hot & humid but the leaves were telling us that Fall was on the way, I went pear picking with Julia. She had connected with a lovely man who had three huge, old D’Anjou pear trees in his yard: more pears than any one family, no matter how pear-loving, could possibly go through in a season. He was nice enough to let us pick as many as we liked, hoping that someone else could enjoy the bounty. And did we ever! We picked and picked; it was only a little more than an hour, but picking like that always make me sympathize with farm workers (it’s not an easy living, folks). Nonetheless, sweaty & tired, we both went home with about 50 pounds of delicious D’Anjou pears. Most were quite underripe when we picked them, bright green and rock hard, but I figured a few weeks in the garage would help them to ripen slowly. Tragically, when I checked on them last week, I discovered one big box had gone to mold; I then decided it was time to get my pear preservin’ jones on. A lot of these uncultivated pears were tiny, as in, not much bigger than a golf ball. Let me just tell you how annoying it is to try to peel & core a golf-ball sized pear: really annoying. So annoying, in fact, that I decided to round up a big batch of the smallest, ripest pears, and use my No Peel ‘Em method to make pear butter: simply halve or quarter the pears, remove stems, and simmer in liquid until soft. Then push through the food mill and you have easy-peasy pear pulp with which to make delicious pear butter. As for flavorings, I wanted to stay away from the traditional cinnamon-nutmeg-clove as it seems so much better suited to apples; pears are much more floral and delicate. The flavor of these pears is quite spectacular and I wanted their taste to shine through. I think I stole the fennel idea from Julia (a tweet maybe?) and well, we all know that I’ll add booze to anything. And how did it turn out? Quite nicely, in fact. The texture is just a touch more grainy than an apple butter, but the flavor is lovely, with a nice tang from the white wine, and just enough fennel to accentuate the floral pear flavor. I also used my procratinaty method (rapidly becoming my go-to fruit butter method) and in less than an hour of cooking the butter was thick & dreamy. Best of all, the recipe made quite a large batch, so I’ll have extra for gifts this winter. 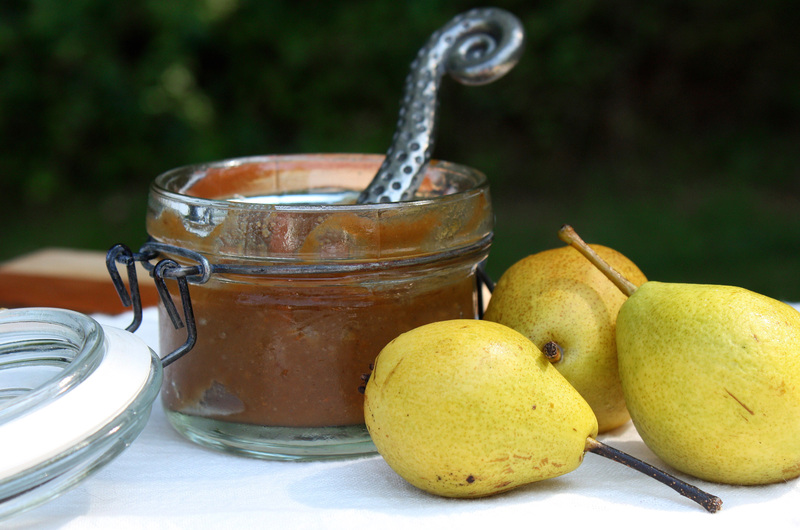 If this gorgeous weather has been tempting you outside, consider going pear picking and putting up some of your own pear preserves; you’ll be happy you did. 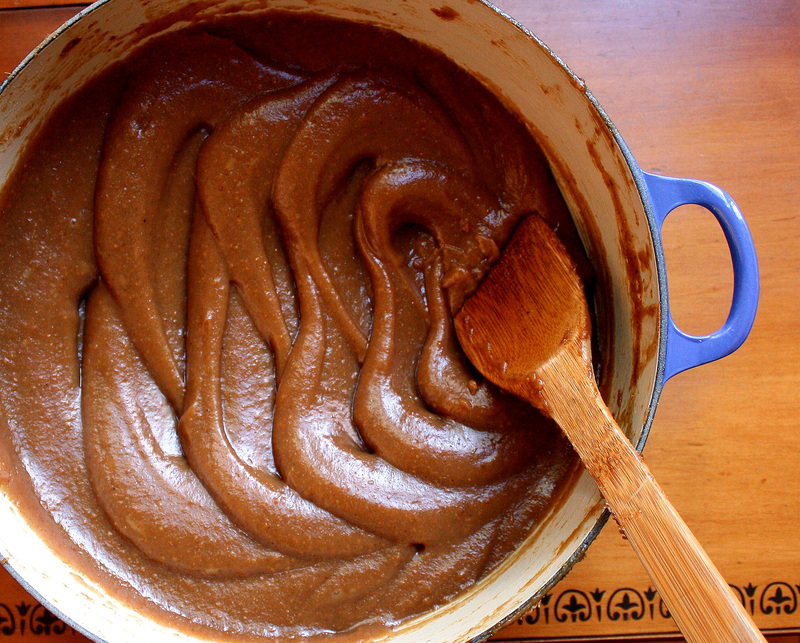 Adapted from No Peel ‘Em Apple Butter and Procrastinaty Peach Butter methods. p.s. I forgot to mention that this was the maiden voyage of my brand-new, happy-birthday-to-me, crazy-ridiculous-sale-price Le Creuset 6 and 3/4 quart wide oven (pictured above). I’m happy to report it performed beautifully – I think I’m in love. Add water, wine and lemon juice to a large (8-quart) stockpot. Rinse the pears, halve or quarter them (leaving peel & core intact), remove stems and add to the stockpot. Bring the pears, covered, to a boil over high heat. Reduce heat to low and simmer, covered, until pears are very soft and falling apart, 30 – 60 minutes. Stir occassionally to make sure all pears are submerged in liquid. Transfer (in batches) pears and their liquid to the bowl of a food mill. Process through the mill to yield pear pulp; discard seeds & skins. Transfer pear pulp to a jelly bag suspended over a large bowl (I had to do this in two batches) or a large colander lined with several layers of dampened cheesecloth. Allow to liquid to drain off of pear pulp until no longer dripping, about 2 hours. (At this point you can continue, or refrigerate the pear pulp and juice separately and continue any time within 3 days). Transfer the pear juice to a large (6-quart), heavy-bottomed preserving pan or Dutch oven. Place the fennel seeds into a cheesecloth spice bag (or use a tea infuser) and add to the juice. Bring to a boil over medium-high heat and continue to boil, stirring occassionally, until volume is reduced by about 3/4, juices are syrupy, foaming and bubbling thickly (temperature will be about 212 – 215 degrees F at this point), about 30 minutes. Skim foam if desired (as the juice reduces, it is easy to skim foam away from the sides of the pan; not really necessary in a butter, but I usually do it.). Before the syrup reaches 220 degrees F and starts to gel, remove the fennel spice bag and add the pear pulp, sugar and honey. Mix well to combine, reduce heat to low and simmer, stirring frequently, until the butter is thick enough to mound on the back of a spoon and will make visible tracks in the pot when you stir, about 30 – 60 minutes (a splatter screen is helpful here to keep the stovetop clean; butter will spit). Ladle hot butter into hot, sterilized jars to 1/4-inch headspace. It’s especially important with this viscous butter that you run a wooden utensil (chopstick or handle of a wooden spoon) around the edges of your jars to eliminate any air pockets. Wipe rims, affix lids, and process in a boiling water bath for 10 minutes. To get the fennel flavor that I wanted, I actually used a rather convoluted method; I started with 1/2 tsp fennel seeds boiled along with the pear juice. The fragrance of this was perfect, but when I added the pear pulp, the fennel was somewhat lost. I then put another, fresh 1/2 tsp of seeds to the tea infuser and added it to the butter; however, since the butter at this point isn’t very wet, it does not pick up the fennel flavor very well. Therefore I made a simple syrup of 1/2 cup water + 1/2 cup raw sugar, added 1 tsp of fennel seeds, and boiled this down until reduced by half. I removed the tea infuser from the butter and strained the fennel-infused simple syrup into the butter. I got the flavor I desired, but there is no reason to torture you with this method. I think 1 tsp of fennel in the initial juice boil will do the trick. If you love fennel, maybe up it to 1 and 1/2 teaspoons. I wasn’t sure that the wine flavor would come through, but there is definitely a subtle tang that I can recognize as Casal Garcia. Nevertheless, I think this would be just as good with straight fennel; if you would rather skip the wine, replace it with water or pear juice. Canned, in a cool dark spot for up to 1 year. Refrigerated, up to 2 months. Late summer to early Fall. I’ve got some honey that is a very rich, deep, dark color and the flavor is strong. I’m wondering how it might fare in something like this. The wildflower honey I used was a raw honey, sort of medium amber, with a little more oomph than a clover honey but not as rich as a mountain or sassafras honey. If that’s what you have on hand, I’d say give it a shot; a good way to tell if it will work is to simply taste a schmear of honey on a slice of pear – does it overwhelm the pear flavor, or complement it? You can always add it 1 tbsp at a time, and taste in between additions, to make sure you don’t overdo it. Or you could omit the honey altogether and sub in a little extra sugar; but I liked the added completxity of a bit of honey in the mix. Oh, that’s a great idea (trying the honey on a slice of pear first). Thank you! I’ll be sure to let you know how it turns out if I make it. That is GORGEOUS. First, I love your pot. I love mine, have had it for 6 years, and I want another one. Your pear butter looks like caramel. Score for the stovetop method. The crock-pot doesn’t do that. And procrastinaty is such a great technique! Don’t you love pots of macerating fruit in your fridge? I’m with you on that. I had tons of macerating nectarines until I forced myself to make jam and sauce. What was I doing instead? Writing my blog of course! 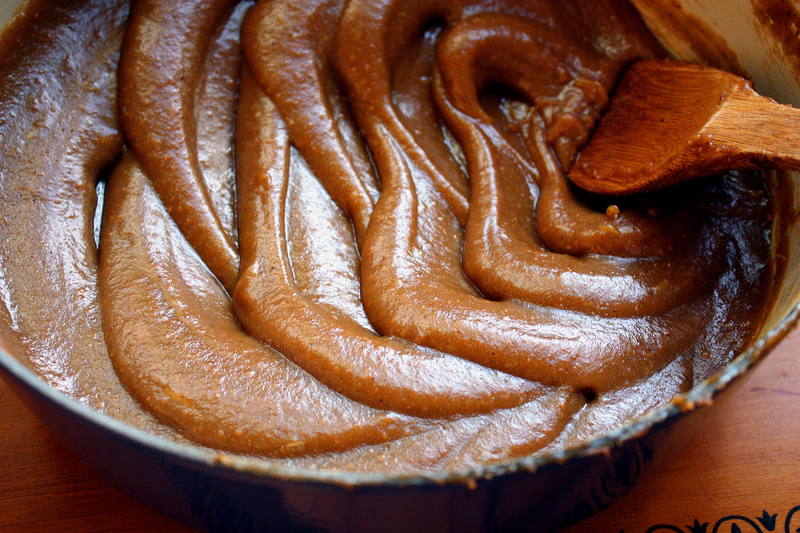 if only I could Mike Teavee myself Wonka-style and swim in that pot of pear butter… it looks beyond amazing! How the flip did you get that perfect pattern on your butter in the pan? As I read through your pear recipes I’m feeling more and more inebriated. I may have to go for a lie down before I start cooking my pears. Decisions, decisions…..